Diane and I had a wonderful chat on Friday evening on Skype, chatting about our most recent knitting projects and generally just gabbing away the hour. To listen to the podcast directly you can check it out here on Libsyn and to listen to it on iTunes go here! I hope you enjoy listening to it, and as always, happy knitting! 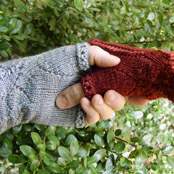 This entry was posted in Knitting, Pattern Design on June 12, 2013 by LadyDanio. Happy New Year (and other fun news)! I hope everyone had as happy of a new year as I did! Well, I nearly always have a happy new year, since New Year’s Day is my birthday. It’s like there’s a built-in party for me the night before my birthday every year! However, I must say that this New Year’s Eve and Day was especially nice, as I had friends helping me celebrate it in style with a huge party and dancing and eggs benedict and balloons and men in drag and cupcakes and even a toaster oven (I love my new toaster oven)! So, there’s some fun new stuff on the horizon this year that I’m really excited about and wanted to share with you. Or give you teasers about, since this post is just a short burst of information. First off, I discovered two awesome things – my last ever shipment of yarn from The Sanguine Gryphon arrived yesterday and it was nommy and delicious and tinged with bittersweet regret. 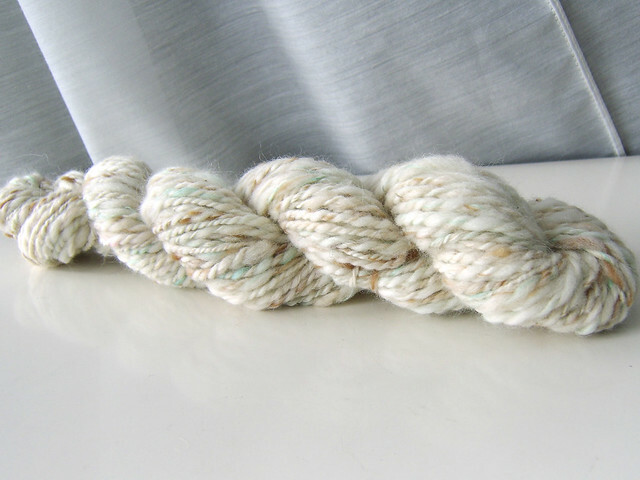 I will be sharing pictures with you sometime the next week or so of the new yarns, I promise. 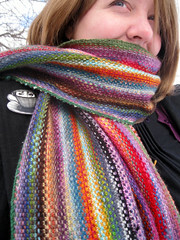 Also, my Mini Mania Scarf pattern was both the featured pattern of the day on The Daily Knitter and was a “best of 2011” stashbusting idea at The Knitter’s blog! If you haven’t stopped by the Mini Mania knitalong we have going on over on Ravelry, you’ll have to poke your head in sometime soon. I’m “knitting along” in the KAL with the other ladies (I don’t think any gents have joined us yet, so I’m safe saying lay-dees) and we’re all having fun looking at each other’s miniskeins and progress on our projects. I didn’t want to leave our cowls lovers out in the cold, so I just started making a sweet cowl that will eventually become a companion pattern to the Mini Mania Scarf. Which reminds me, I need to take a photo of the minis I am using! And that leads me to another exciting new year’s goodie. I got a brand new camera this Christmas, and I can’t wait to share all the uber-techy details with you (and loads of pretty pictures too, I swear)! More on that will be in another blog post this month, but yippee! I’m excited about my new toy. 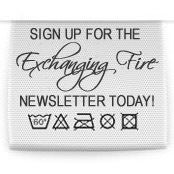 Last but not least, I bit the bullet and decided to get myself an official newsletter mailing list so that I keep keep all of you better informed of what’s going on in the Exchanging Fire circle. If you are interested in getting shop updates, pattern premieres, special deals and more supercool information like that from me, you can sign up here! I promise only to email you when something terribly important is going on and I’m having kittens* because I’m bursting from the news. *No kittens were harmed or birthed in this metaphor, unless you count that weird dream I had three years ago about my best friend giving birth to kittens. That one really freaked. me. out. 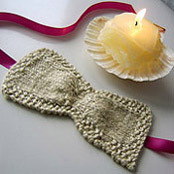 This entry was posted in Blogging Stuff, KALs, Knitting, Pattern Design on January 4, 2012 by LadyDanio. Check me out in The Knitter! 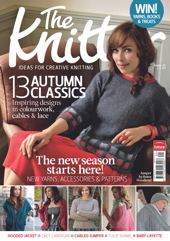 I was stalking The Knitter, a UK knitting magazine, religiously this summer. 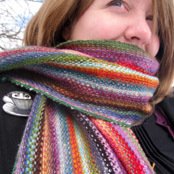 The editor, Juliet Bernard, had asked if she could feature my pattern, the Mini Mania Scarf, in one of her stashbusting blog posts. I was thrilled, of course, and started watching like mad for it. Well wouldn’t you know it, right after I gave up the hunt she posted about my pattern! It was last month, but her stashbusting tips for all of the fabulous ways you can use up yarn are totally still relevant. Plus, hey look, there I am! But there’s more! The Knitter (hard copy side) contacted me again because they are doing a larger spread about stashbusting in their next issue, and wanted to know if they could reprint my pattern photo there as well! I think that if the pattern is being featured (or, as the case may be, a teeny picture in the corner) it should be the most current issue, issue 36, which went on sale Sept. 5 in the UK. If any of my European readers have found it, I’d love to have a scan of the page or a copy of the magazine. Either way, keep your eyes peeled for me, please! UPDATE: I wrote to one of the editors who initially contacted me to ask where my picture was featured, and she was so kind as to give me a digital copy of the page that my scarf was on. Yey! They had originally told me that the reason they were interested in featuring my scarf was because a reader wrote them a letter talking about it. 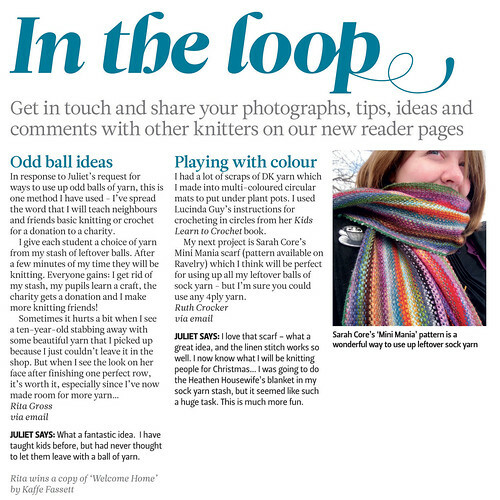 So they actually wrote about my scarf in a response to the reader, whose letter they published in a section of the magazine called “In the Loop”. Very exciting! 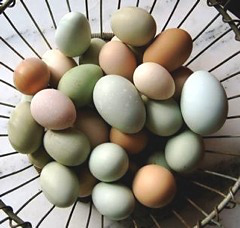 In other news, I’ve joined Craftsy and I’m loving it – it’s a great complementary site to Ravelry because it offers me a chance to share my non-knitting related stuff (ok, that’s like, one sewing project, but still) and it offers great online classes and stuff like that. What fun! This entry was posted in Blogging Stuff, Pattern Design and tagged crafty, featured pattern, juliet bernard, magazine, mii mania scarf, remnants, scraps, sock yarn, stashbust, stashbusting, the knitter, uk, yarn on September 14, 2011 by LadyDanio. 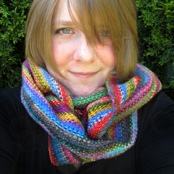 My Pattern is Published – For Real! 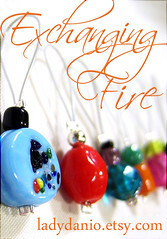 That’s right, girls and boys, I’ve moved beyond the world of self-publishing on Ravelry. My first pattern design, the Ruched Sleep Mask, has been published in the Knitting 2012 Day-to-Day desk calendar that just came out! My complimentary copy of the calendar came at the end of June, and I’ve just been waiting until July to tell you all about it, since July 15 is when the actual calendar went on sale. It’s available at Amazon, as well as through Barnes and Noble, Borders, and probably in your local mom-and-pop book shop as well. I’m so excited and just had to share the good news! 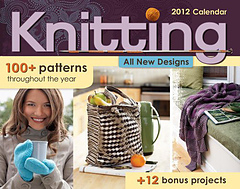 This entry was posted in Pattern Design and tagged knitting 2012 desk calendar on July 21, 2011 by LadyDanio. 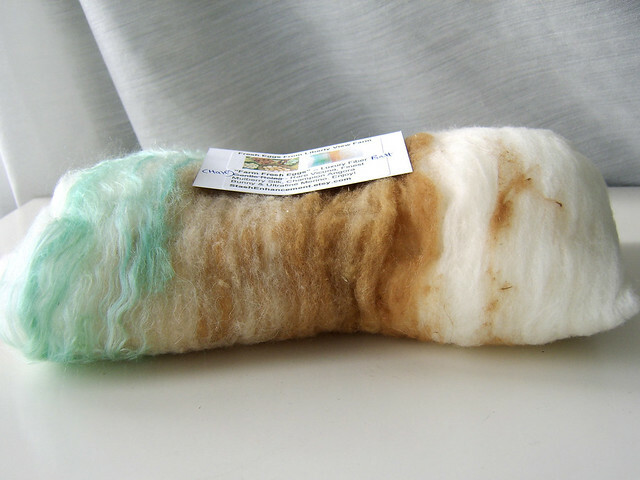 This beautiful handspun not only contains StashEnhancement fiber, but to stretch the yardage a bit I added a 2 gram sample of blue-green hand-dyed bamboo rayon from Fiber-Fancy’s November Phat Fiber Stocking Stuffer, a 7 gram sample blend of angora and merino from Natchwoolie’s November Phat Fiber sample called Snow Bunny and another StashEnhancement sample, 2 grams of fine cashmere, ultrafine merino and mulberry silk called Natural Light from the November Phat Fiber box. I adored seeing this process through from start to finish. This is a very easy shawl and I think I might just write it up as a free pattern when I get around to it, so that others can make a sweet little striped kerchief as well. 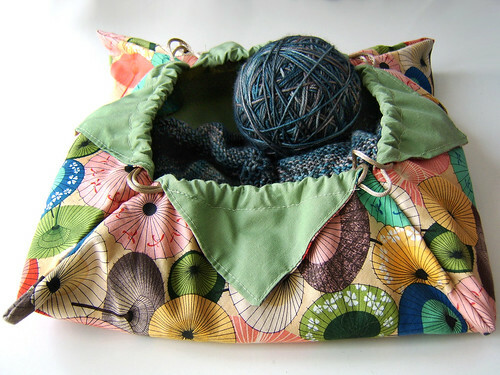 This entry was posted in Knitting, Pattern Design, Phat Fiber Box on December 15, 2010 by LadyDanio. My favorite project bag is this lotus-shaped drawstring bag I own. It’s square with some design features that reminds me of Japanese origami, the beautiful art of paper folding. I love the way it folds in on itself like those old fortune teller paper games we used to play in school when we were children. The design is both simple yet clever. Pulling the drawstring shuts the bag and creates handles for carrying, all without losing its basic shape. 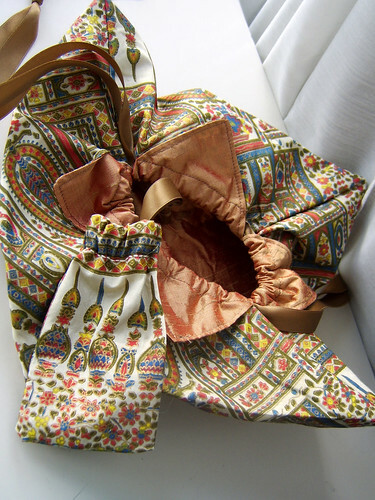 I knew this bag design would be perfect for the vintage fabric my grandmother bought while traveling in India in the ’70s, but when I looked around the Internet in an attempt to make it, I couldn’t find a pattern or tutorial for the design I liked anywhere. I really wanted to have it replicated, so I just decided to write my own pattern! I’m a rudimentary sewer myself, so I assure you this pattern isn’t hard and will gently stretch your abilities. Let’s get sewing! You’ll need two matching squares of fabric that are roughly 18 inches square and some matching ribbon. The final product, when all said and done, is going to have a 12-inch wide flat bottom. 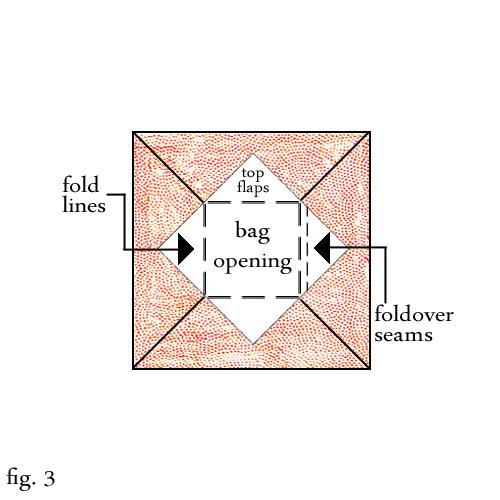 Note: If you use squares of fabric that are larger you will make a larger bag and if you use squares that are smaller your bag will, consequently, be smaller. First, take the two pieces of complementary fabrics and place the designs facing each other so you see the wrong side. If you have thin fabrics I recommend added a layer of interfacing of some sort for added strength. Sew the two fabrics together like you would for a pillowcase, leaving yourself a small hole. Then flip the fabric inside-out. Ta-da! Your fabrics are all sewn together and look like a flat, er…thicker piece of fabric. Don’t worry, we’re getting there. Second, iron your fabric so that it’s easier to work with. This is where the fabric starts to look like origami, and as the Japanese masters will tell you, trying to fold wrinkled paper (or fabric) never works well. Before you start folding, however, we’re going to sew a nice little edging on the flat piece of pillowcase fabric to make it look finished and to keep the seam from sliding around. This should be about an eighth of an inch from the edge of the fabrics and can be as simple as a backstitch or as complex as crazy ornate miniature heart shapes. Whatever. It’s totally up to you. Now we’re getting to the folding. At this point, your square of fabrics should be laid flat with the fabric design that you want to be the exterior fabric facing you. 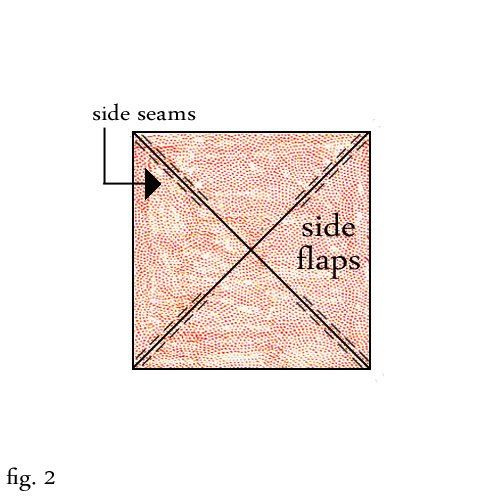 Turn the fabric at an angle so it looks like a diamond shape to you (see fig. 1). 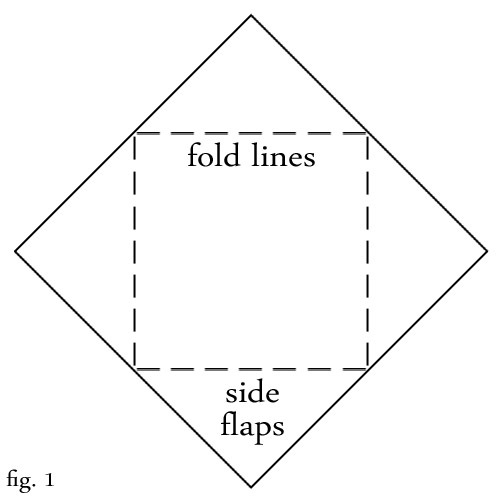 Then fold each corner diamond inward until it is touching in the center like the Four Corners out West. Can you see the paper fortune teller game right now? I know, so cool! Your folded flaps should now show only the interior fabric. Those flaps are going to become the interior side panels of the bag. Seam up the four sides of the bag halfway (about four inches), making sure that the interior of the bag is still facing you (see fig. 2). This is important, because you are going to flip the bag so that the seams are facing inward when you are done. The reason we only sewed up the sides of the bag halfway is because to create that lotus-like appearance, the unsewn flaps need to be folded over the outside of the bag. This creates the four origami points that look very similar to the points of a flower petal. To help the four points stay put, we’re going to sew them to the exterior of the bag roughly half an inch from the opening (see fig. 3). 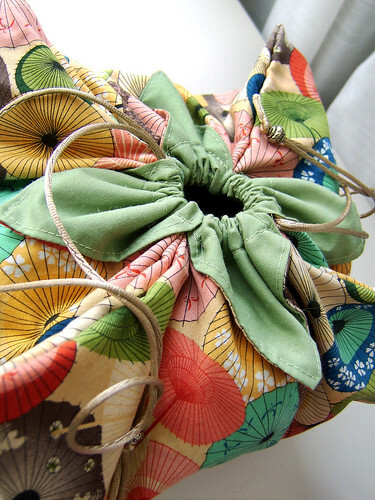 This creates a hole or gap large enough to draw ribbons or cord through to make the bag a drawstring one. Lastly, cut two long satin ribbons or silken cord. I usually cut them as long as my arm from fingertip to collarbone, but you’ll need to gauge the length yourself. Take one ribbon and thread it through all four half-inch gaps we sewed at the opening of the bag. Tie the ribbon to itself when it reaches the beginning. At the opposite end from where you started threading the first ribbon, take the second ribbon and repeat the process. Pick up the bag, pull the cords, and watch the bag close! Note: The biggest mistake newbie drawstring bag makers find themselves making is at this point. If you pull your cords and the bag doesn’t close but the ribbons just hang taut, you may have knotted the first ribbon to the second. That’s never going to work so unknot and try again. Enjoy making your own origami lotus bag! I have a second origami lotus bag now, sewn out of some vintage fabric my grandmother brought back with her from India in the 1970s. I am absolutely in love with it – I even had some pale brown ribbon that, just by chance, matched the fabric perfectly! My friend Heidi sewed it for me, and helped me pick out the silken orange interior, which, naturally, I ordered from India. Ah, the magic of the Internet. I had this little pocket that my grandmother had sewn ages ago, as well, so I handstitched an edging to slip the matching ribbon through there as well. Hm, my stitches don’t look to bad in this photo. This entry was posted in Pattern Design, Techniques and tagged bag, drawstring, easy, fabric, fat quarter, lotus, lotus bag, lotus project bag, origami, origami bag, origami lotus bag, origami project bag, project bag, sew, sewing, sewn, square, tutorial on August 5, 2010 by LadyDanio.